Avocados make me really, really happy. Some of my best memories are of eating avocado with my friends and family. Good times. But I had never experienced an avocado in all it’s glory…straight from the tree…until we arrived in L.A. While we were there, my friend Carrie-Anne brought me a bag full of these amazingly creamy gems. They are perfect. I have been in avocado bliss ever since :). I am so totally jealous that she has an avocado tree in her yard. And if you have one too…don’t rub it in. Maybe I could plant one on top of the RV. Hmmmm…. I once read that in Hawaii avocados can grow up to 5 lbs. each. OH. MY. It’s worth the plane ticket just for that. 🙂 Anyone else want to move to Hawaii so we can all live in a fruit-filled utopia? That IS avacado perfection. I always have to hold my breath when I cut into a grocery-store avacado. It’s about a 50/50 chance that the thing won’t be gross. Sigh. And let me just say (spell), AVOCADO. When my sis was in Ecuador their avacados were huge like that too…like the size of small/medium footballs! Great, huh?! I’ve seen a few in the stores now and then but haven’t tried one yet. love ya! My partner and I live on Maui, and we have an avocado tree right next to our home. The branches hang over our roof, so sometimes we have been startled out of a deep sleep by the sound of a giant avocado falling on our roof and rolling down onto our deck. 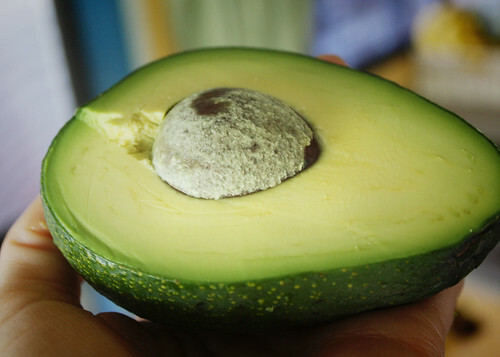 That is a very beautiful avocado. I am not eating them much, and actually had never even tried them until I started eating Raw, and I think they are very good. I haven’t seen any around here that are beautiful like that though! There is something about an avocado isn’t there. I think its becuase you never know for sure if its going to be perfect, so when it is its such a thrill. Avos got me through a pretty desolate veggie childhood – mum used to give me avos with sprouts and tomatos on wholemeal bread for school lunches – its still my favourite lunch today. I just came back from visiting my family up in north Queensland (Australia) and my Dad was selling some avocadoes that he’d picked that were the size of small footballs. I have 4 ripening on my bench at the moment. Can’t wait til they’re ripe! Laurel…so glad you like them 🙂 I usually eat 1/4 – 1/2 avocado a day, but try to limit my other fats/nuts. My favorite way to eat them is in chunks topped with fresh lemon juice and sea salt. I also love them in salads…especially the kale avocado salad. Yum! I’ve been eating that salad for lunch nearly every day lately. I just spent the last 13 months living on the Big Island of Hawaii and it’s true. The avocados are huge! We had many trees throughout our neighborhood and one in our yard. That is one thing I will miss for sure. They are so full of flavor, not like the ones they sell in the store. Glad you got to experience one right off the tree. Thanks for your blog. I really enjoy it. I am not thinking of going 100% raw, but definitely want more raw in my diet. Thanks! Great recipes too! I visited my uncle once when he was homesteading on a mountainside in Hawaii. We ate fresh picked mangoes for breakfast each morning, with the juice running down our chins, and HUGE avocados, straight from the tree, sliced over just-picked greens for lunch. HEAVEN! Mmmmmmmmmm avocados are my most favorite food on the planet! I love just eating them with a spoon! Everyone looks at me like I’m crazy. Then they tell me they don’t like them. And they’ve never had them. I don’t fight with them cause MORE FOR ME! Oh the yum. When we moved to Florida I was delighted to try the Florida cultivar; it’s large and has a very big seed and is delicious. Also, unlike the Hass, the flesh doesn’t turn black quickly, so I can keep a cut one in the fridge for a couple days while I snack at it. Not fair at all….I was there when you got those avocados…but didn’t get any : ( I’m glad you enjoyed them!! 🙂 Love you! YES! Count me in!!!!!! Oh how I love avos and I want to move someplace where I can have my own avo, coconut and banana trees and gee, Hawaii sounds great to me! I will be partaking of that creamy goodness when I get home. How about Brazil- my sister in law has an avocado tree in her back yard- seriously head size avocados. They thought I was crazy as I would just bask in awe at them. YUMMY YUMMY YUMMY!